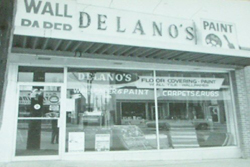 Delano's Home Decorating has been serving local area homes and businesses since October of 1945 when it was established by Alden and Lillian Delano. Current owners, Jon and Margaret Delano, proudly carry on the tradition of quality products and service today. Being family owned and operated for generations, Delano's Home Decorating takes pride in carrying quality products and providing outstanding service to the community. We have built strong relationships with our repeat customers and are honored to service the next generation of these customers as well. Over the years, our friendly staff has worked with home owners, as well as, area developers, local businesses, and government agencies. Among those are: the DeKalb County Courthouse, DeKalb Municipalities (Fire Department, Police Stations, etc. ), the DeKalb Park District, and the DeKalb School District. To accommodate our customers needs our showroom features over 6,000 square feet of display area. Our team is ready to help you with all of your remodeling, renovation and new construction projects.